Mini sales fell 34.5 percent in January. Production in Oxford is pictured. MUNICH -- BMW said today that it would shed 850 workers at its plant in Oxford, England, where it makes the Mini. The carmaker said the global economic slowdown had hit demand for the Mini, which celebrates its 50th anniversary in August. BMW said 850 agency workers on the weekend shift will be laid off. Staff who currently work weekend shifts will be redeployed to one of the weekday shifts. The cuts will come into force from March 2 when the plant begins operating five days per week, instead of current seven. 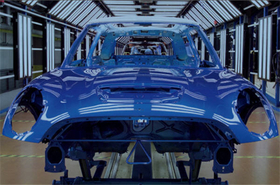 The Mini factory, which employs about 4,500 workers, produced 235,000 cars last year. The British trade Unite reacted angrily to the job cuts. "Sacking an entire shift like this and targeting agency workers who have no rights to redundancy pay is nothing short of scandalous," said Tony Woodley, joint boss of Unite. Woodley said the union would ask to meet with the company as soon as possible to discuss the cuts. BMW said: "While Mini has been weathering the economic downturn, it is not immune from the challenges of the current situation. Against this backdrop the company felt that a review of its shift patterns was necessary." Mini sales fell 34.5 percent to 10,120 in January, compared with the same month in 2008. BMW brand sales were down 22.1 percent to 60,248. BMW said the sales drop was in part due to the lack of availability of the Mini Convertible, which accounts for 16 percent of Mini sales. Production of the Mini Convertible ended in mid 2008 and a new model will launch in March.